Around 240 B.C, the Greek astronomer Eratosthenes devised a way to measure the circumference of the earth. He knew that each year on the summer solstice the sun would pass directly overhead and illuminate the bottom of a well in the city of Syene, about 500 miles south of Alexandria on the Tropic of Cancer. On that day, when the sun was at its highest in the south, he found that a stick in Alexandria cast a shadow at a 7.2 degree angle. This angle corresponds to the solar zenith angle – the angle between the sun and the point in the sky directly overhead. He reasoned that the distance between the two cities must therefore constitute 7.2 degrees of a circle, which indicates a circumference of about 25,000 miles. Eratosthenes made two assumptions here: that the earth is a globe and that the sun is distant enough that its rays are essentially parallel. Eratosthenes’ experiment alone does not prove that the earth is a globe because his assumptions must be true in order for his conclusions to be valid. Flat earthers reject these assumptions and posit that the sun is much smaller and closer to the earth so that its rays are not parallel. This can produce a 7.2 degree shadow just as easily. In order to find out which is the case, we must work backwards from these assumptions and see what each would entail if true, then we can find a way to test them. After arriving at the circumference of the Earth, Eratosthenes is said to have made an ambitious attempt to map it. In doing so, he helped to invent the concept of latitude and longitude, a geographic coordinate system based on angular distance north or south of the equator and east and west of the prime meridian. In order to find the latitude of Alexandria, Eratosthenes would have just needed to wait until the winter solstice and repeat the experiment, in which case he would have measured a shadow angle of 56.2 degrees. Subtracting the 7.2 degrees between Alexandria and the Tropic of Cancer, this gives 48 degrees as the angle between the Tropic of Cancer and the Tropic of Capricorn. Dividing by 2, this would have placed the Tropic of Cancer at 24 degrees north of the equator (the latitude of the Tropics have fluctuated throughout history and continue to do so today) and Alexandria at 31.2 degrees north. Modern science places the earth’s radius at 3,959 miles, which gives a pole to pole circumference of about 24,875 miles. Dividing by 360, we find that one degree of arc should be about 69.1 miles on the earth’s surface. That is why lines of latitude are about 69.1 apart. 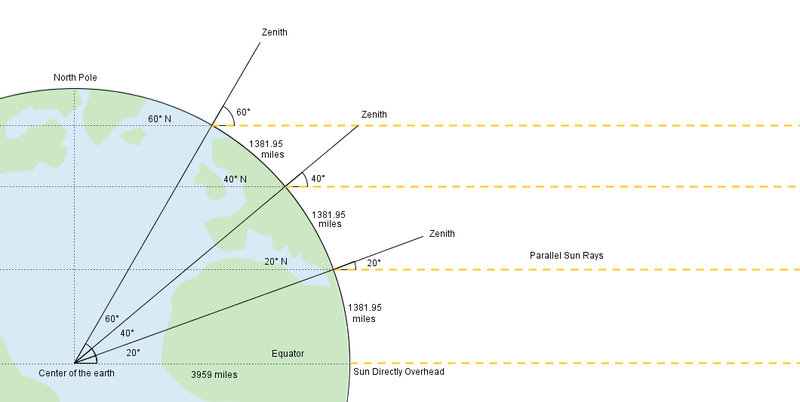 So on a globe for every 69.1 miles or one degree of latitude you move north or south of the point the sun is directly overhead, the angle of the shadow in that location would increase by one degree. If Eratosthenes was correct, the angle of his shadow must have been equal to Alexandria’s latitude north of Syene, because that would be the angle that Alexandria is leaning away from Syene due to the curvature of the earth. If three other astronomers had performed the experiment on the same day at 20 degrees, 40 degrees, and 60 degrees north of the Tropic of Cancer, they would each respectively measure a shadow angle of 20 degrees, 40 degrees, and 60 degrees, and all would arrive at a circumference of 24,875 miles. The beauty of Eratosthenes’ experiment is that you can repeat it anywhere on earth, on any day of the year, and arrive at the same circumference. This is where the flat earth model runs into problems. In the flat earth model, as a consequence of geometry, as your distance from the point the sun is directly overhead increases, the distance between each successive degree of shadow will also increase exponentially. 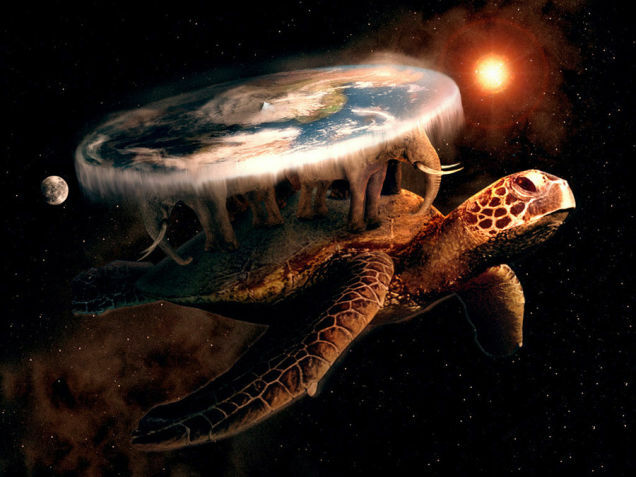 For example, assume the sun is giving off a 45 degree shadow at 45 degrees north, as depicted in this flat earther meme. If the earth were flat, that would mean that the sun is, more precisely, 3,110 miles high. In that case, it would be 1,132 miles to the 20 degree shadow, 1,478 miles between the 20 and 40 degree shadows, and a whopping 2,777 miles between the 40 and 60 degree shadows. Someone performing Eratosthenes’ experiment at 20 degrees north of the Tropic of Cancer would arrive at a circumference of 20,376 miles, someone at 40 degrees north would get 23,486 miles, and someone at 60 degrees north would get 32,320 miles. 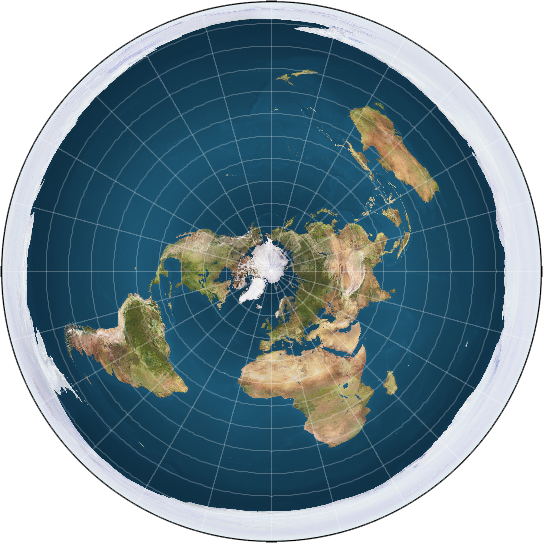 Flat earthers use the Azimuthal Equidistant Projection map, which shows all points at an undistorted distance and direction from the center. Lines of latitude on the flat earth map have the same spacing as those on the globe: 69.1 miles per degree. It is for this reason that the angle of the shadow can only be equal to the degrees of latitude between you and the point the sun is directly overhead in one location. Everywhere south of that point the shadow angle would be greater than the latitude and everywhere north of that point the shadow angle would be less than the latitude. If the sun were 3,110 miles above the flat earth, the 20 degree shadow would be 16.4 degrees north, the 40 degree shadow 37.8 degrees north, and the 60 degree shadow 78 degrees north. Only at 45 degrees north would the latitude and the angle of the shadow actually match as they would everywhere on the globe and only there would someone arrive at a circumference of 24,875 miles. You can change the height of the sun all you like, the latitude and angle will only be the same in one location. Even then, it is only a coincidence due to the random height of the sun, not a direct function of latitude as it is on the globe. 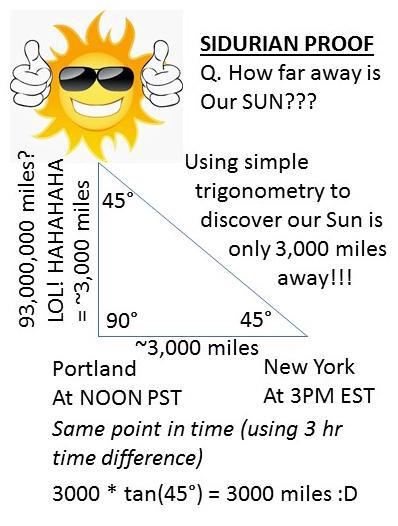 To be sure, if each of our astronomers were to measure a shadow angle corresponding to their latitude, as is to be expected on the globe, and you were still assuming a flat earth model, that would require that from 20 degrees north the sun be 3,797 miles high above the flat earth, at 40 degrees north 3,294 miles high, and at 60 degrees north 2,393 miles high. An impossibility. The only possible solution would be to distort the flat earth map beyond recognition by staggering the lines of latitude, but even then it would only be correct for a single day, as the sun moves to a different latitude each day and the model would again become increasingly wrong. So to recap, if the earth is a globe, the angle between the sun and 90 degrees overhead must be equal to the degrees of latitude between you and the point the sun is 90 degrees overhead in every location. If the earth is flat, this can only be true in one location. Testing this discrepancy between these two models has the potential to end to this debate once and for all. You can do this test yourself. You can’t be in two places at once to take multiple measurements on the same day but, lucky for us, the zenith angle of the sun in the sky changes everyday as the sun moves between the Tropic of Cancer and the Tropic of Capricorn. Since the sun is moving a fraction of a degree north or south each day, you can stay right where you are and test a new angle every day. Go to this website, enter your location, and look at the sun transit time to find out when the sun will cross over your line of longitude, when it is directly south of you. When this time comes, go outside, find something that casts a shadow, measure it, and carefully measure the length of the shadow. 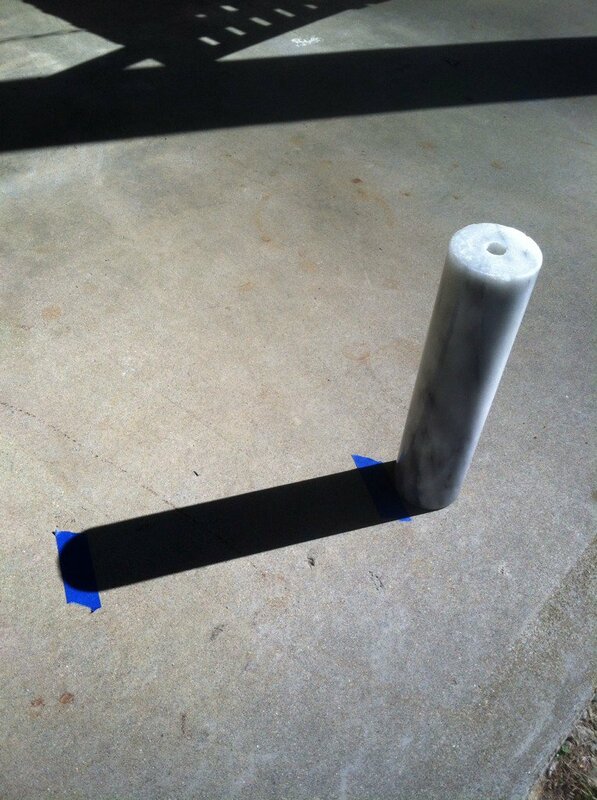 Only measure to the edge of the solid dark part of the shadow, not the lighter penumbra at the end. Divide the length of the shadow by the height of the object and hit inverse tangent on your calculator to get the angle of the shadow. For precision’s sake, the sun has an angular diameter of about 0.5 degrees. The end of the dark part of the shadow is defined by light from the top of the sun passing over the top of the object, while light from the bottom of the sun crosses over the top of the object to mark the end of the penumbra, giving it the same angular width as the sun. 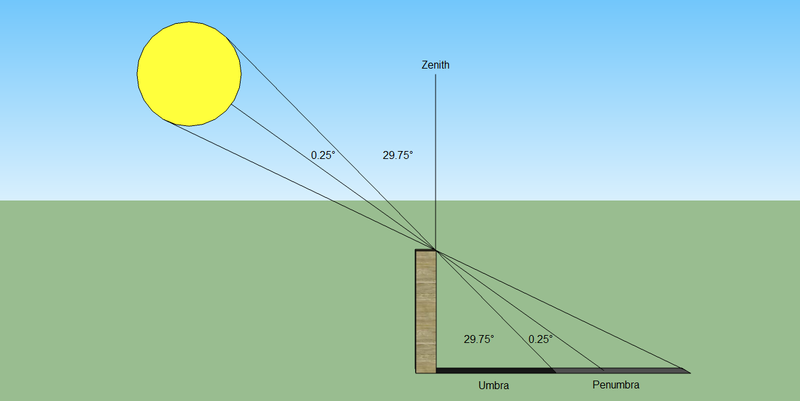 To get the zenith angle of the center of the sun, add 0.25 degrees to your shadow angle. Go to this website and see which latitude the sun was overhead at the time you measured the shadow. If the earth is a globe, the result, depending on the precision of your measurements, should be equal to your latitude. 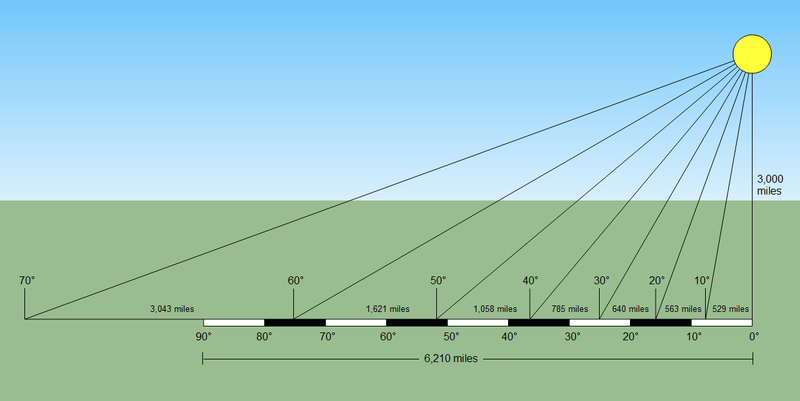 To find the circumference of the earth as Eratosthenes did, multiply the shadow angle by 69.1 miles to get the distance. Divide 360 by the angle of the shadow, and multiply that by the distance. If the earth is round, the result should be close to 24,875 miles. Find the angle of a shadow at ANY time of day when the sun is out. Find out where the sun was at overhead at that time. Type those coordinates into Google Earth and measure the distance from there to your location with the ruler set to degrees. Compare this to the angle you measured. This method is especially damning because of the degree at which longitude lines diverge south of the equator on the flat earth map. Multiply the angle by 69.1 to get your distance from the point the sun was directly overhead. Divide this by the tangent of the angle to get what should be the height of the sun if the earth is flat. Now see what latitude the sun will be overhead two weeks from now. Convert it to decimals. If it’s in the opposite hemisphere, add it to your latitude, if not, subtract the lower from the higher. This is the angle of the shadow you should get if the earth is round. Multiply this angle by 69.1 to get the distance. Divide the distance by the height of the sun from step 2 and hit inverse tangent to get the angle of the shadow you would expect on a flat earth. Wait two weeks and find the angle of a shadow again as you did in the first test. If you get the angle you found in step 3, the earth is round. If you get the angle you found in step 5, the earth is flat. Still not convinced? Try it on the winter solstice, the spring equinox, and the summer solstice. Be amazed as you get the same angle you would expect to get on a globe each time. Is there any way for a flat earther to ad hoc their way out of this? They could say that the sun is constantly changing height to give you the correct angle. Presumably it would be doing this for your sake as it would only work for someone at your exact latitude, giving everyone else in the world wildly inaccurate results. They could say the sun position website is wrong and the sun is moving away at increments that give you the correct angle each day, even though again, this would only be working for you. If you’re in England, the sun would have to be past the ice wall on the winter solstice to get an angle like 75°. They could come up with some kind of woo about the position of the sun being an illusion, but while you’re over there in David Copperfield land with your buoyancy gravity, we’ll be here in reality getting things done.